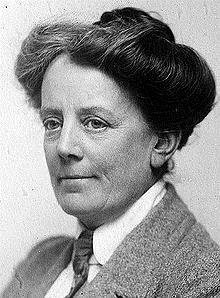 Dame Ethel Smyth, the pioneering composer, writer, suffragette, and Surrey resident, died on this day, 8 May, seventy years ago in 1944. Born in 1858, Smyth determined at an early age that she would enter the music profession, and resolved to travel to Germany to train as a composer. During her time in Continental Europe she was personally acquainted with many famous names in the music world, including Brahms, Clara Schumann, Grieg, and Chaikovsky. Back in England as of the 1880s, the list of celebrated people with whom she came into contact steadily increased. Empress Eugénie, Queen Victoria, and Princesse de Polignac all supported her music, as did Thomas Beecham, Bruno Walter, Adrian Boult, Henry Wood, and Donald Tovey amongst others. Another of Smyth’s famous friends was Emmeline Pankhurst, who led her to devote two years of her life to the ‘Votes for Women’ campaign as a leading suffragette. She even served a sentence in Holloway Prison for actively participating in a window-smashing campaign. In later years, she became increasingly deaf, and developed what she termed a ‘second string’ as a writer, principally of memoirs and polemical essays. In this activity she was prolific, publishing ten books in a little over two decades. At this time, she also enjoyed friendships with the writers Virginia Woolf and Edith Somerville. In my research, I’ve been particularly interested in Smyth’s relationship with Virginia Woolf from their first meeting in 1930 until Woolf’s suicide in 1941, which yields much insight both into Smyth’s activities as a writer and into the differences between the disciplines of music and literature more generally. This work has resulted in major articles in the Oxford journals Music and Letters and The Musical Quarterly. More recently I’ve also enjoyed getting to know Smyth’s music better, working with staff and students of the University. Some of us presented a lunchtime recital of Smyth’s music in Woking, the town where she was resident from 1910 until her death, on the day of the anniversary. Update on 12 May 2014: I’m delighted to say that my blog entry has been selected as an “Editor’s Picks” post and remains on the front page of the OUPblog.